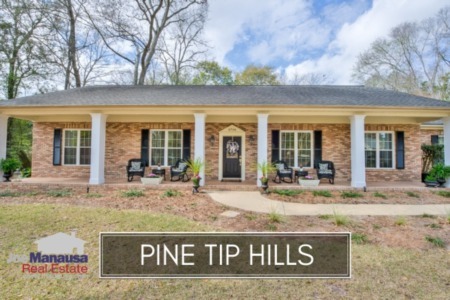 Pine Tip Hills is a relatively small neighborhood in Northwest Tallahassee that contains relative large homes. In fact, we often say that this is a hidden gem for homeowners who want to be close to town and live in a large home. It is "hidden" because it is a few hundred yards west of the east/west boundary in Tallahassee, so many homebuyers overlook this subdivision because of their desire to be in NE Tallahassee. With more than half of all home sales occurring in the northeast quadrant of Leon County, many shoppers mistakenly limit their search to this area when looking for large homes on large lots. Unfortunately, these buyers are deprived of seeing what Pine Tip Hills has to offer. The bulk of the homes in Pine Tip Hills were built during the 1980s and 1990s, though some are newer. In this article, we will look at long term average home price trends, value trends, and size trends of homes sold in Pine Tip Hills, as well as all current listings in the Tallahassee MLS and all closed home sales going back to 1991. It is important to note that the narrative contained below is for sales through December for all previous years, but through the first week of November in 2015. The graphs and the closed sales table will be continuously updated into the future (meaning bookmark this page if you always want to know the current status of homes in the Pine Tip Hills). Due to the relatively small number of homes sold each year, the long term trends in Pine Tip Hills have frequent variations. This is not uncommon with smaller neighborhoods. Unlike everywhere else in Tallahassee, average home prices peaked in 2012 in Pine Tip Hills (only 2 sales that year though). Average home prices dropped almost 40% since that point, but have been heading slightly higher this year. Pine Tip Hills provides a clear example of why tracking average home prices often misleads those looking for information on real estate appreciation (as shown below in the valuation section). The average recorded home sales price in Pine Tip Hills through this writing in 2015 has been $346,300, which is down fractionally compared to our last published report. Home sales activity has averaged between 2 and 13 sales per year for the past 12 years, and this year the pace is very near the high end of that range. Due to the smaller size of this neighborhood, expect to see and up and down pattern of sales, which in no way indicates good or bad news, just the fact that our sample size for reporting is relatively small. Thus far in 2015, there have been 11 closed home sales in Pine Tip Hills, which is nearly triple the amount closed in all of 2014. Average home values in Pine Tip Hills are down about 5% in 2015 versus 2014, which is completely contrary to the 3% increase in average home prices shown above. This means that values and prices are heading in conflicting directions, which can be explained by looking at "what buyers are buying" which we do in the "average home size" section below. Through early November, the average value of a home sold in Pine Tip Hills has been $129 per square foot, which is slightly higher than we reported in our last Pine Tip Hills report. Unfortunately, values are still lower in 2015 than they were last year. The average home size sold in Pine Tip Hills typically falls in a range of 2,500 to 3,500 square feet, and the past two years we have seen buyers selecting homes at the lower end of this range. Thus far in 2015, the 11 homes sold have averaged 2,694 square feet. One of the reasons that we track average home size for a neighborhood is because it helps us explain the discrepancy between average home price movement versus average home value movement. When home sizes vary, we are no longer comparing (apples to apples), so size changes end up explaining the difference between value and price adjustments. 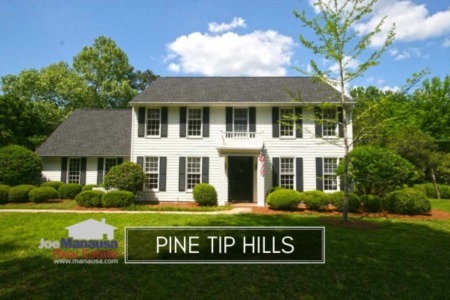 The following list shows home sales in Pine Tip Hills going back to 1991. I hope you enjoyed our November 2015 update on home sales in Pine Tip Hills, please feel free to drop me a note if you have questions not covered in this report.